The Mercury GigE camera series is an industrial vision camera, with a GigE interface. 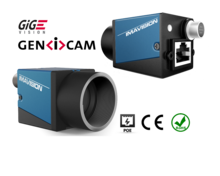 GigE is the most common interface used for cameras in traditional machine vision applications. The camera is available with and without Power over Ethernet (PoE). Power over Ethernet (PoE) for GigE is designed to provide both power and data communication over a standard Ethernet cable. This reduces the amount of cables and installation time, in applications that do not require a hardware trigger or I/O. When I/O is required in an application we advise to supply the camera via a I/O connector. The camera’s power usage is larger when using Power over Ethernet than via the I/O connector. The camera will generate extra heat when using PoE. A PoE GigE camera is larger than the version without PoE. An extra PCB is needed to separate the power of the Ethernet signal, and to convert the voltage to a lower voltage. Extra hardware is needed, which makes it more expensive than the version without PoE. The advantage of PoE is that installation is easier because less cables are required. (FOV). Column and Row Binning Modes to Improve Image Quality when Resizing, Simple Two-wire Serial Interface. Programmable Controls: Gain, Frame Rate, Frame Size, Exposure, Automatic Black Level Calibration,On-chip Phase-Locked Loop (PLL).